Blackpool fans can be forgiven for rolling their eyes at the news of yet another court hearing but this week’s date in the High Court could well have major ramifications for owner Owen Oyston. Valeri Belokon’s application to have a court receiver appointed to recoup the £25m he is still owed by Oyston will be heard on Wednesday. The Latvian’s lawyers Clifford Chance, who it is understood have already identified a receiver, are considering going down this route to bring an end to the recent impasse. The hearing will be heard at the Rolls Building in London in front of Justice Marcus Smith. 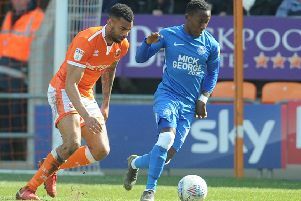 A court receiver could be brought in to discharge the assets of Owen and Karl Oyston as well as Segesta – which owns Blackpool FC, the stadium, the training ground as well as the Travelodge and Quernmore Hall. If approved by the judge, this would be an unprecedented move in English football. It would involve a lot of uncertainty – and the potential threat of a 12-point deduction by the English Football League. This is because under EFL rules, the appointment of a court receiver is deemed ‘an insolvency event’ in the same way administration is. To clear up some of the uncertainty, The Gazette spoke to Tim Fielding, a solicitor and honorary vice-president of Blackpool Supporters’ Trust, to get his personal view on what this week’s hearing could mean for Oyston and the football club. We put a series of pressing questions to him and this is what he had to say. What can we expect from Wednesday’s court hearing? “It really is completely uncharted territory. “I believe the receiver has already been identified by Clifford Chance and we would hope they have a football background. “What we don’t know yet is whether Owen is going to oppose the application. “I think we’ve got to assume he will oppose it, therefore we will have a contested hearing dealing with the issue of the receiver’s appointment. “But the judge could well give him short shrift on that because he’s previously said if Owen wants to make any representations and if he wants to submit any evidence then he’s got to do so at least seven days before the hearing. “It will be interesting to see if Owen will try and do something in the meantime to either persuade Valeri to withdraw the application or trump it in some way. What’s the difference between a court receiver and an administrator? “There is a practical distinction to be made between the role of a court receiver and of that of an administrator. “A court receiver is appointed purely for the purposes of effectively implementing the enforcement of Belokon’s judgement. An administrator is normally brought in by the directors. “However, what people will see on a practical level with the appointment of a receiver will be very similar to what they would see if an administrator was appointed. “So we can expect to see a relatively senior practitioner/accountant to be appointed to oversee everything. “The interesting bit will be what they then do with the football club. My expectation is they will trade it pending sale. manager of the football club to work alongside them. That’s because his remit will be wider and will be to collect all the incomes in and seek a sale of all the assets. When and how will the football club be sold? “Under an administration and under EFL rules under administration, you can’t sell within the first 28 days. But I don’t think that will apply in a receivership. “You would think they would market the football club with the stadium, ideally anyway. They’d sell them together. “If someone buys the football club without owning the stadium, then there’s all the uncertainty that would bring with it and that would put people off. “I wouldn’t want that and I don’t think anyone would want to see that happen. “I think we’ve seen at places like Coventry City, Stockport County and Crystal Palace how toxic a situation can arise when the owner of the stadium is different to the owner of the football club because they’re pulling in different directions. When will boycotting fans be able to go back? “You’ve got to bear in mind that the Not A Penny More movement is all about the individual’s choice. I think every individual has got to say ‘how do I view this?’. “I’ve been canvassing views and I’ve detected quite a hardline stance on it, which actually surprises me to a degree. “People have said they won’t go back unless they’re 100 per cent certain that Owen will have no future involvement in the club. “My view is that is too hard a line to adopt because the whole point of the NAPM campaign, for me, is to get Oyston out of control of the club. “If we have a scenario that looks like it will bring that about then we should be supporting it, not boycotting it. Because that’s what would happen, we would effectively be boycotting the receiver’s operation of the football club. “But it’s a difficult one. I had always assumed we’d go back together but my concern is we may end up going back piecemeal. “While Owen can be ousted from the football club I’m not sure they can completely oust him from the stadium because he has offices for his other businesses on one floor of the hotel. Will stadium bans be lifted? “For those individuals who have been banned from the stadium for arbitrary reasons, which I know a number have, I think that should be lifted. “It’s different if you have a football banning order, you can’t do anything about that. Will Blackpool be deducted 12 points if they do go into receivership? “I’m expecting a 12-point deduction. Whether the EFL might be persuaded in some way to reduce it, not to apply it or suspend it remains to be seen. “My understanding is it’s the EFL’s management committee who make the decision on the points deduction and that’s made up of chairmen of other clubs. “I don’t think they’re going to be particularly sympathetic to the situation because it’s a bit like turkeys voting for Christmas isn’t it? A points deduction for Blackpool will indirectly help those other clubs. “The EFL might have the power to suspend it in some way, shape or form and that might be where BST’s representation to them might well hit home to some degree. Maybe even the receiver might make some representation. “It would be inequitable in my view for Blackpool to get that deduction because we’ve not had any perceived advantage on the football field. “The whole point of the points deduction being brought in was to discourage clubs from overspending, either on stadium development and team development, and creating a perceived advantage. “I don’t think anyone could accuse Blackpool of having received an advantage, either now in recent years.